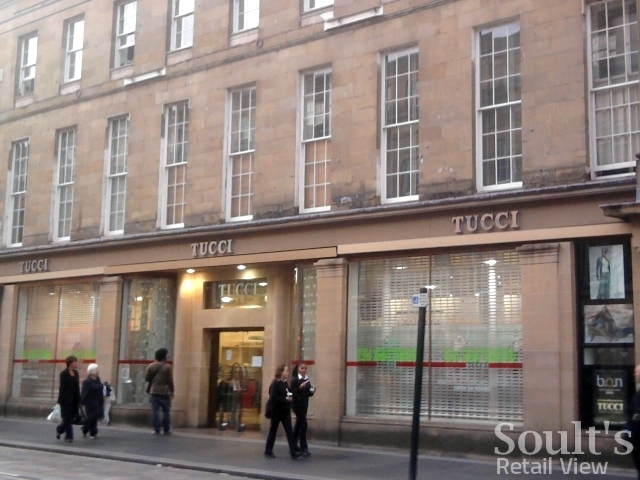 Wandering along Newcastle’s Grainger Street yesterday afternoon, I was quite surprised to see that the old Tucci fashion store – which closed down probably several months ago – is now trading again in its former premises. 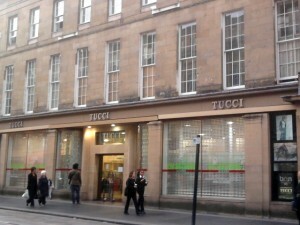 Whatever the rationale for the change of heart (and there’s some discussion/speculation about that here), it’s clearly a positive move in that it brings one of Grainger Street’s longest retail frontages back into use – while Tucci has been closed, it has really looked very blank indeed. 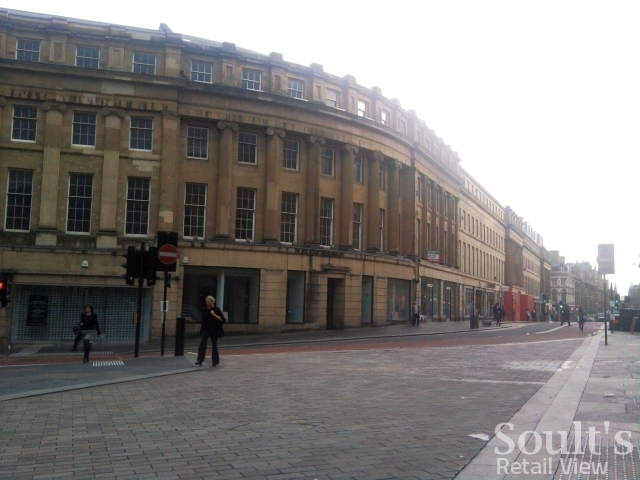 Even with Tucci’s return, however, the retail fortunes of the Grainger Street and Market Street area are looking a little fragile. On the other side of the road, three prominent units stand empty next door to each other – the former Karen Millen and Kookai stores (the latter empty since early 2006), and another unit that, apart from being occupied for a couple of months each year by The Xmas Box, has not had a tenant since being refurbished as part of the Grainger Town Project several years ago. Nearby, the former Millets and Coast units have been empty since earlier this year, while the former Thomas Cook site, next to Greggs, must have been vacant for the best part of a decade. It’s hard to know how far this is a Newcastle city centre problem. After all, many of these voids reflect the wider fortunes of the retailers concerned – such as Kookai’s administration; Baugur’s woes in the wake of the Icelandic banking collapse; or Blacks Leisure Group’s exit from the boardwear market, and the consequent rationalisation of its portfolio. However, with the news that Oasis and All Saints are to open in Eldon Square South – raising question marks over their existing Market Street stores in the old Binns block – the area’s never entirely convincing aspiration to be the ‘Bond Street of the North’ is looking decidedly shaky. Incidentally, Tucci’s reappearance in Grainger Street prompted me to take a look at the retailer’s website and online store. Its predominance of black is perhaps a little cliched, and some of the pages I looked at had missing image files; generally, however, the site’s not too bad, benefiting from a sensible layout and a useful zoom function that allows visitors to view detailed photographs of the available products. One glaring omission, though – and something that could well be added to my post about expectations of retail websites – is the absence of a list of physical store locations and opening times. The ‘about us’ page only mentions job vacancies, while the ‘contact us’ page makes reference to ‘high street stores’ but fails to say where they are. A visit to the sitemap confirms that no list of stores appears to be provided. The Newcastle Tucci store may therefore have reopened, but anyone browsing the Tucci website would be none the wiser – an oversight that should surely be addressed. Previous story Is Apple Store coming to Newcastle’s Eldon Square? Tucci in the 1950’s was the original Isaac Waltons. This was a long established and very expensive expensive store. The staff from what I remember always wore black suits for men and straight black skirts with a white blouse and black cardigan for ladies.